Body Found Miles From Sunken South Korean Ferry : The Two-Way Nearly two months after the disaster in South Korea, the death toll now stands at 289 and 15 people are still unaccounted for. In late April, rescue workers surrounded the area where the South Korean ferry Sewol sank. The body of a victim was recovered Thursday about 25 miles from this site. The body of a victim in the South Korean ferry disaster was retrieved Thursday, bringing the death toll to 289. The remains were recovered 25 miles from the capsized vessel, according to The Associated Press. Fingerprints identified the body as that of a passenger who had been traveling with his family. His wife and 11-year-old son were previously found dead; his 7-year-old son was rescued, according to the wire service. The body is the first recovered since May 21 — more than a month after the ferry sank on April 16. Fifteen people are still missing and presumed dead. Efforts to recover victims' remains have recently been hampered by poor weather and diver fatigue, reports The Wall Street Journal. Furniture and debris are blocking the interior of the ferry, and divers are cutting through the walls of the ferry in order to reach some parts of the interior. The search is dangerous, according to the newspaper. Three members of the rescue and recovery operation have been killed, including a civilian diver who died just last week. "The ferry, called the Sewol, was nearing the end of what should have been a 14-hour or so trip south from the city of Incheon to the resort island of Jeju on April 16 when it ran into trouble, capsized and sank. Of the 476 people said to be on board, 323 were second-year students (juniors) from a high school in the city of Ansan, near Seoul. Just 75 of the students are said to have been rescued. "The ferry's captain and many of its crew have been arrested. Among the issues authorities are investigating is why the order to evacuate wasn't given for at least 30 minutes. The captain and most of the 29-member crew survived. Seven crew members are known to have died or are missing, though, and a few of them have been hailed as heroes who tried to get passengers off the ferry before it went down." 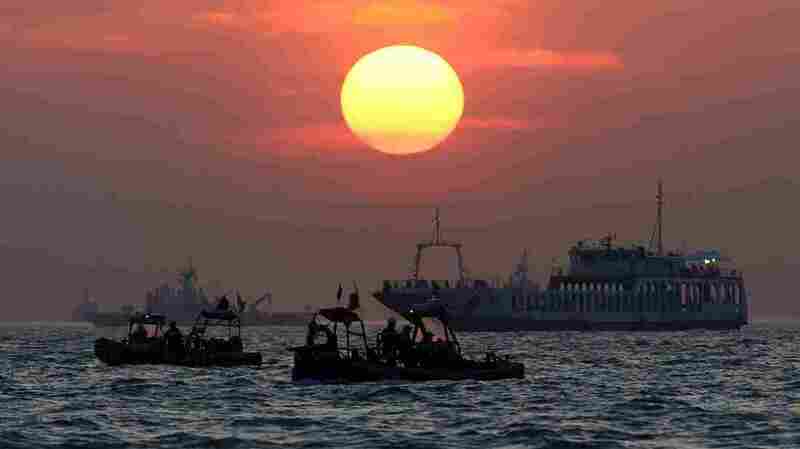 In the wake of the sinking and the ineffectual rescue operation, South Korean President Park-Geun-hye announced plans to disband the nation's coast guard. Meanwhile, the captain and several other crew members are facing charges in connection with the disaster.